eventually a complete makeover. Very few villains achieved greatness right from the start, and have, for the most part, maintained it ever since. Doctor Doom is one of the few. Doom first appeared in the fifth issue of Marvel Comics' Fantastic Four (July, 1962), in which it was made clear that even if readers had never seen him before, he had long-standing issues with the group's leader, Reed Richards, aka Mr. Fantastic. In fact, Reed and Victor von Doom were roommates in college, where Doom unjustly blamed Reed for the accident that so disfigured his face that he's never since been seen without a steel mask. The creators of the character were writer Stan Lee and artist Jack Kirby, the pair behind Thor, The Avengers and a majority of the other series Marvel has been exploiting since the early 1960s. As well-received as the villain was, Lee and Kirby kicked him up a notch in Fantastic Four Annual #2 (1964), in which Doom turned out to be the secret ruler of a small Balkan country called Latveria. He soon dropped the pretense and reigned openly, so his clashes with the heroes could be complicated by diplomatic immunity and other international governmental concerns. Further complicating the situation was that in Latveria, he was regarded as a benevolent monarch (even if a teeny bit on the dictatorial side), reversing the good guy/bad guy polarity when on his own turf. A few past comics villains, such as DC's Eclipso and Marvel's own Yellow Claw, had starred in series of their own — but for the most part, they started out that way. Prior to Doctor Doom, the only ones who began as heroes' supporting characters and later became stars were a couple of Disneys, The Phantom Blot (a Mickey Mouse villain since 1939) and The Beagle Boys (from Uncle Scrooge), both of which had their own Gold Key comics in the mid-1960s. 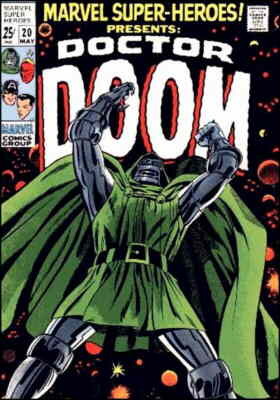 Doom first appeared under his own logo as the cover feature in Marvel Super-Heroes #20 (May, 1969). The following year, he became a regular in Astonishing Tales, which he shared with Ka-Zar, a Tarzan clone, until ousted in #9 (December, 1971). From 1975-79, pooling his plans for world conquest first with those of The Sub-Mariner and later with The X-Men's Magneto, he was featured in the first 15 issues of Marvel's Super-Villain Team-Up. Doom has never been on lunch boxes or Underoos, but he's still had an impact on American pop culture outside of comic books. Many bad guys of modern fantasy, from The Micronauts' Baron Karza to the most famous late 20th century villain of all, Darth Vader, owe much of their appearance and demeanor to Doctor Doom. It's been a while now since Doom has had his own series, but he seldom goes long without surfacing in one Marvel comic or another. Tho his particular animus is still aimed at The Fantastic Four, he's fought practically everybody in the Marvel Universe that's worthy of his attention — and quite a few that aren't. Text ©2003-10 Donald D. Markstein. Art © Marvel Comics.